I am a sucker for bluebirds. They hold a special place in my heart and I knew I had to ink up the bird from Wplus9's All Year Cheer Stamp Set in blue and orange when this stamp set made it's way to my crafty desk. 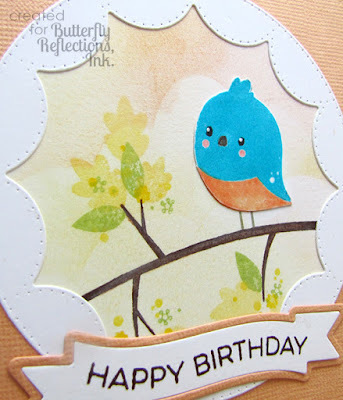 Karen B. here from The Bald Dragonfly, I have a fun and cute card today showcasing stamps and dies from a mix of companies that are available at the shop! 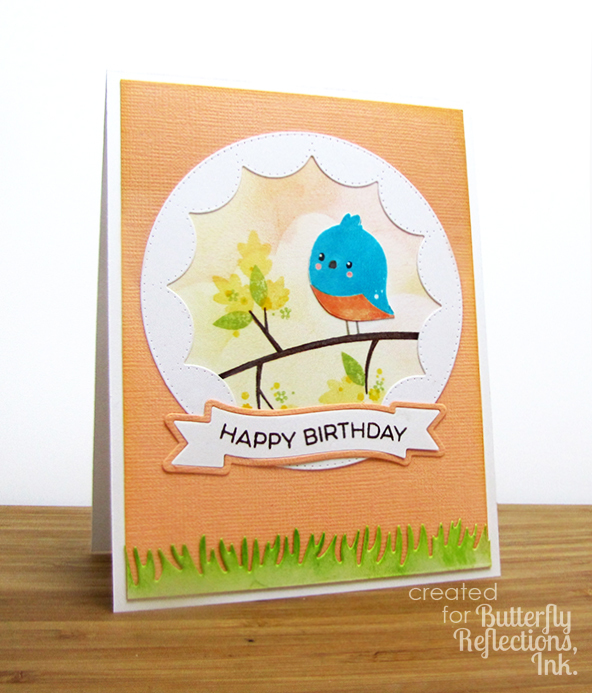 To create my focal scene, I inked up a soft background with peach and yellow inks onto a white cardstock circle. (I was trying to replicate the transition from summer to fall, therefore I strayed away from the blue sky and vibrant green leaves.) I then stamped the branch and leaves from Wplus9's All Year Cheer Stamp Set, as well as the bird in various colors of ink. I then bordered the image with Waffle Flower's Flowers Circle Inverted Dies. This was adhered to a peach cardstock panel and a white cardstock base. I added a strip of die cut grass, similar to MFT's Die-Namics Grassy Fields. 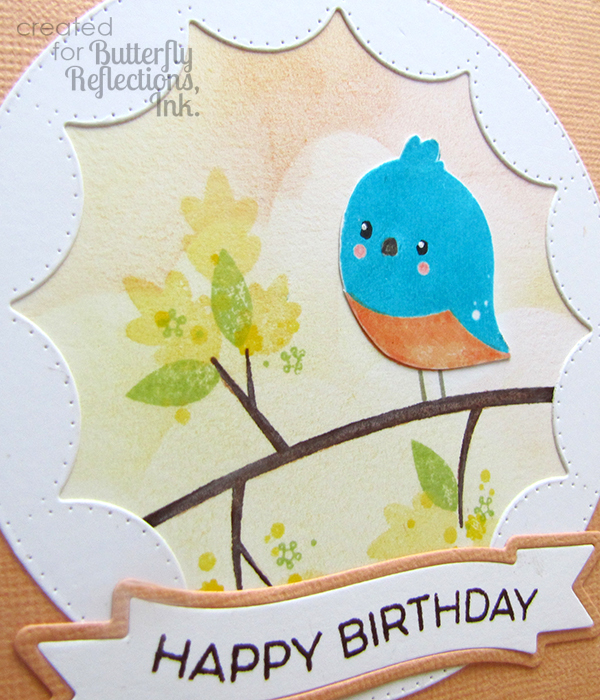 I finished the card with a die cut banner from Wplus9's Bountiful Blooms Die, and stamped a greeting from MFT's Essential Sentiments Stamp Set. This sentiment set is absolutely amazing, the sentiments are the perfect size for banners and there is such a variety of sentiments available! Now how SWEET is this?! Love it! I'm with you, Karen - bluebirds always make me smile and this one is no exception. Love that gorgeous inked background too! This scene totally captures that transition of the seasons! Such sweetness!